Tea Variety Pack providing 30 sachets each of: Jasmine-Infused Green Tea, Earl Grey Green Tea and Peppermint Green Tea. Andrew's Own Green Tea with Jasmine. Originating almost 5,000 years ago in China, Green Tea is second only to water as the world's most popular beverage. Interest in Green Tea's health benefits continues to grow, but since most Americans don't enjoy Green Tea's flavor, we miss out on all its benefits. That is, until now, since I expect that my new Jasmine Infused Green Tea will satisfy even the most finicky American taste buds. We use only Single Region Premium Organic Green Tea from Fujian, China. This tea is well known for its mildness making it perfect for Americans. The capital of Fujian is Fuzhou - a city renowned for its Jasmine, making it the home to China's and our highest quality Jasmine Green Tea. There is no beverage with a longer history of traditional use than Green Tea. There is also no beverage with more science to support its healthy use. Special compounds in Green Tea called Polyphenols are responsible for its benefits with EGCG (Epigallocatechin Gallate) being the most important of these Polyphenols. My Jasmine Infused Green Tea delivers high levels of both Polyphenols (almost 20%) and EGCG (25% of Polyphenols) with less than 3% caffeine making it far milder than a typical cup of coffee or tea. My Jasmine Infused Organic Green Tea is made in the traditional way of a bygone era. It is mild and delicious - without a hint of bitterness. Each cup reminds us of a simpler time when tea was brewed with great devotion and enjoyed in complete tranquility. Our Jasmine Green Tea is made the old fashioned way and contains no Jasmine blossoms. Instead, when our Green Tea is ready for drying, we introduce freshly-picked autumn Jasmine flowers to the drying room. As the Jasmine blossoms open, warm air is circulated throughout the room causing the natural Jasmine fragrance to infuse our Green Tea. This process is repeated seven times over several days to achieve the perfect balance and flavor. This is the same centuries-old, traditional method by which the world's finest Jasmine Green Tea has been made. Andrew and Muriel's Own Earl Grey Green Tea. Originating almost 5,000 years ago in China, Green Tea is second only to water as the world's most popular beverage. Green Tea's health benefits are well-established, but since most Americans don't enjoy Green Tea's flavor, we miss out on its wonderful benefits. On the other hand, Americans love Earl Grey tea - the world's most popular flavored tea, but since it is made with Black Tea, it lacks the health benefits of Green Tea. That is the unique opportunity our Earl Grey Green Tea presents, since it offers the traditional flavor of Earl Grey with all the benefits of the finest Green Tea. Earl Grey has always been Muriel's favorite tea, but she was very disappointed to learn it lacked Green Tea's health benefits. She then asked me if I could create a "healthy" Earl Grey tea with all the benefits of Green Tea. The tea you hold in your hand is the result. Traditional Earl Grey is a blend of Black Tea with a small amount of bergamot oil derived from the rind of the bergamot orange, a fragrant citrus fruit from Italy. Our exciting new Organic Earl Grey Green Tea uses our Premium Green Tea to create a rich, flavorful Earl Grey tea, but with the added peace of mind that comes with the health benefits of the finest Green Tea. Our Organic Earl Grey Green Tea is a unique way to bring you the classic flavor of time-honored Earl Grey in the form of one of the healthiest and most celebrated beverages - Green Tea. It is mild and delicious - without a hint of bitterness. Each cup reminds us of a simpler time when tea was brewed with great devotion and enjoyed in complete tranquility. There is no beverage with a longer history of traditional use than Green Tea. There is also no beverage with more science to support its healthy use than Green Tea. Tradition and science partner perfectly in our Organic Earl Grey Green Tea to provide a delicious new opportunity to embrace the health benefits of Green Tea. Research has shown that special compounds in Green Tea called Polyphenols deliver its benefits. EGCG (Epigallocatechin Gallate) is the most important of those Polyphenols and is the ongoing focus of extensive anti-aging research. Of course, our Organic Earl Grey Green Tea delivers high levels of Polyphenols and EGCG, while also being perfectly balanced, providing mild levels of caffeine - less than those found in a weak cup of coffee or cup of black tea. Andrew and Muriel's Own Peppermint Sencha Green Tea. We use only Single Region Premium Green Sencha Tea from Organic-Certified gardens in the Fujian Province of China. Fujian Green Tea is the finest Green Tea in China and it is known for its rich, yet mild flavor, which makes it a perfect choice for Americans. Sencha Green Tea is traditionally produced in Japan and is well known for its mild flavor. "Sencha" refers to the absence of grinding the tea leaves, which retains its magnificent flavor and aroma. Originating almost 5,000 years ago in China, Green Tea is second only to water as the world's most popular beverage. Green Tea's health benefits are well-established, but since many Americans don't enjoy its flavor, we miss out on its wonderful benefits. Our Peppermint Sencha Green Tea presents a unique opportunity, since it offers the refreshing flavor of our Premium Full-Leaf Peppermint with all the benefits of the finest Green Tea. Muriel and I sought to create a Green Tea for those who don't like ordinary Green Tea, so we started with the finest Sencha Green Tea and took a lesson from Muriel's childhood in France where they only served Green Tea with fresh mint. The result is a Green Tea for those of you who, like us, prefer the refreshing flavor of mint over the sometimes bitter taste of typical Green Tea. Of course, our tea also delivers high levels of protective Polyphenols and EGCG with only mild levels of caffeine - less than those found in a very weak cup of coffee or a cup of black tea. We use only the finest Premium Sencha Green Tea from Organic-Certified gardens in both Japan and China. We select only Sencha Green Tea because it is respected as the world's finest and mildest Green Tea, making it a perfect choice for our finicky American taste buds. Sencha Green Tea is distinguished from other teas by its absence of grinding and other harsh chemical or physical processing. This "normal" tea processing results in the chemical "damage" (oxidation) that causes the unpleasant bitterness of typical green or black teas. Our minimally processed Sencha Green Tea preserves all the elegant flavor and subtle aroma of its pristine Green tea leaves. Peppermint (Mentha piperita) is the most popular member of mint family of plants. For thousands of years, Peppermint has been used traditionally, not just for its uniquely fresh flavor, but also for its calming and soothing properties, particularly for the digestive system. Our Premium Full-Leaf Peppermint is cultivated in America's Pacific Northwest - home to the world's finest Organic Peppermint and it is certified free of all pesticides and herbicides. It is unprocessed, so you can enjoy all the pure, natural freshness of our exceptional Organic Peppermint without a hint of bitterness or any unwanted contaminants. Andrew's Own Green Tea with Jasmine Brew in pure water at approximately 185º F (85º C). This is best achieved by allowing boiling water a moment to cool before introducing the tea sachet. You can vary the amount of water used or extend the brewing time to adjust the flavor. Unlike typical Green or Black Teas, prolonged brewing will not cause bitterness. For iced tea, place a pitcher of newly made tea in the refrigerator to steep overnight to be consumed cold the following day. Andrew's and Muriel's Own Organic Earl Grey Green Tea Brew in pure water at approximately 185º F (85º C) for 3 to 5 minutes. This is best achieved by allowing boiling water a moment to cool before introducing the tea sachet. You can vary the amount of water used or extend the brewing time to adjust the flavor. 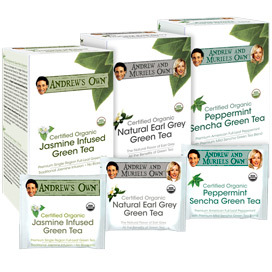 Andrew's Own Peppermint Green Tea For a refreshing herbal tea, place one sachet of our Organic Peppermint Green Tea in a cup or teapot of pure water at approximately 185° F (85° C). This is best achieved by allowing boiling water a moment to cool before introducing the tea sachet. Steep for approximately 3 to 5 minutes and then allow to cool and enjoy. Of course, feel free to vary the amount of water used or modify the brewing time to adjust the strength of the tea. Unlike typical green tea, prolonged brewing will not cause bitterness due to the unique quality of our tea. You can also add ice or refrigerate to make a healthy, delicious and refreshing iced mint green tea.